Gifts for Pet Lovers and Pets Need Presents Too! 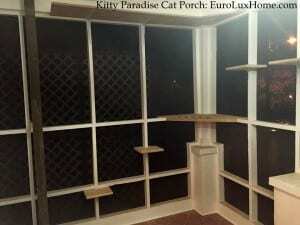 We are spoiling our cats with our new cat paradise front porch – it’s their gift just in time for the holidays. I have gift ideas for pet lovers too! Before I take you on a tour of the cat porch, I have to show you these hand-painted pictures of our pride and joys. 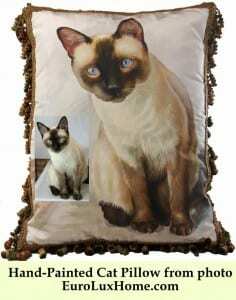 Here’s the pillow of our Sealpoint Siamese cat Minkey, including the photo we provided to the artist inset on the left. 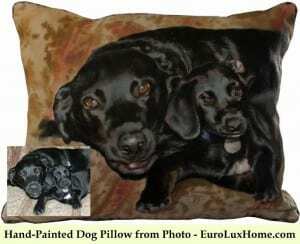 This is the photo we sent of Rudy and Jake, inset on the hand-painted pillow. You can see the high-quality of the artwork. The dogs look so lifelike I almost want to stroke them! Choose the pillow size (14″ x 18″, 16″‘ x 16″, or 16″ x 20″), the fabric (silk or linen), and the trim (cord, flange, or tassels). Prices start at just $295, including free shipping! This custom-made line is so new in our store, we don’t even have the pillows on our website yet. 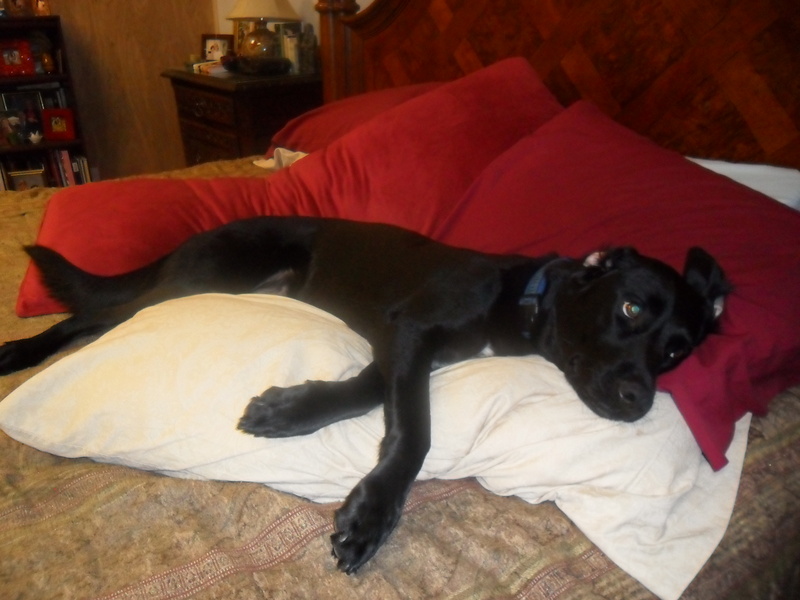 So email us your favorite pet photo and we’ll take care of the rest. Of course, you could always give a gift certificate to a friend or family member if you aren’t sure which photo to use! 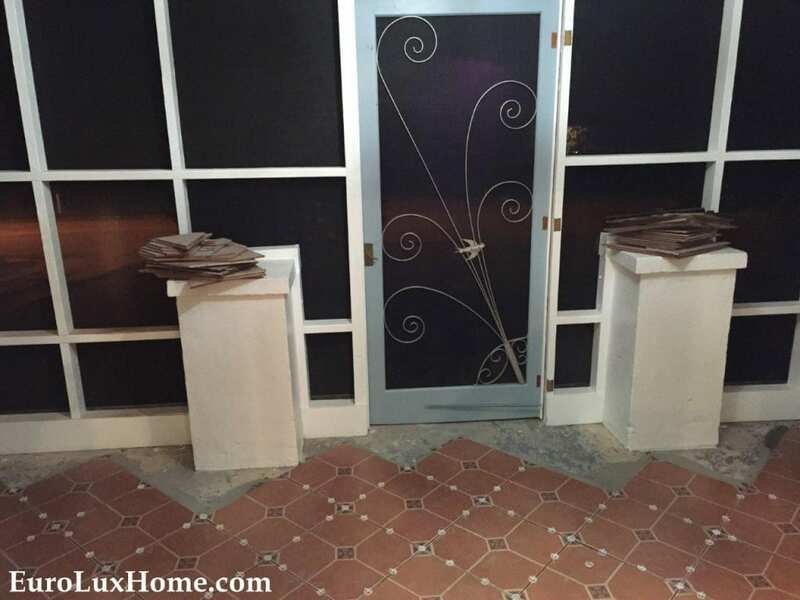 Regular readers of this blog know that Greg and I finally moved into our renovated 1920s vintage bungalow last month. On our first night in our new home our dogs Rudy and Jake (pictured above on the pillow) patrolled the house all night long. Good dogs! They were guarding to keep us safe. But they kept us awake with the clicking of their nails on the laminate floors. We had to schedule toenail clips at once! The cats have been making the transition to the new house in stages as it’s important that we are more settled first. 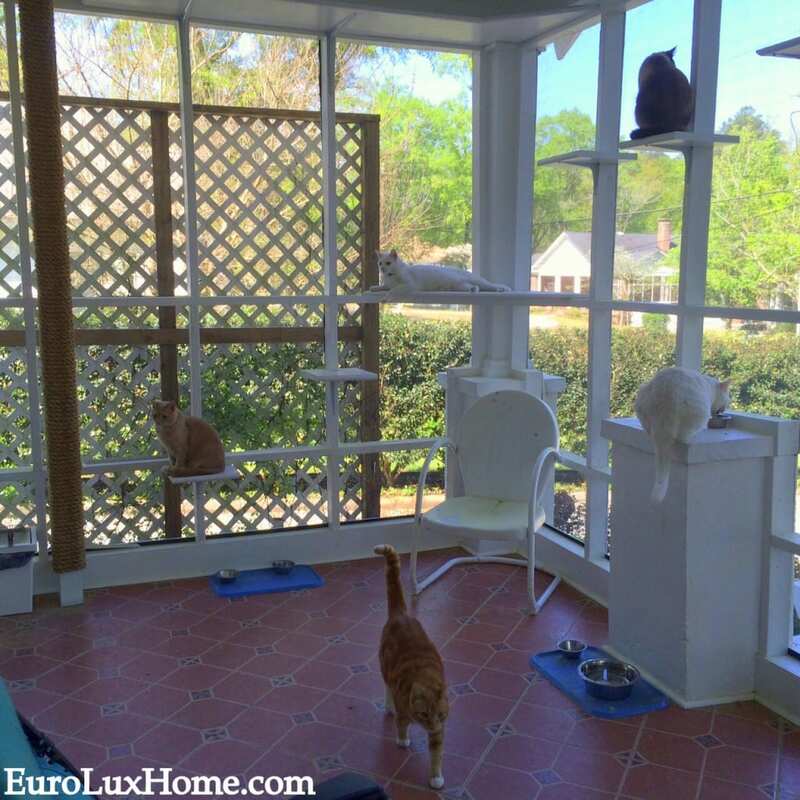 But I was so excited for them to see their new cat paradise front porch. The pole on the left will be wrapped with rope so they can climb it like a tree. They have kitty doors so they can go out whenever they want. 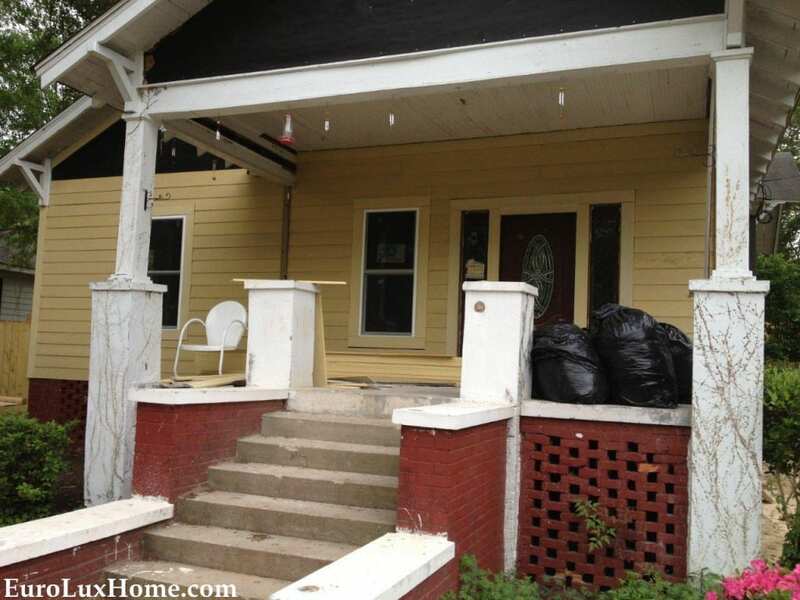 The jumping and perching platforms haven’t been painted yet, but we’ll show the finished porch in an upcoming blog. You should have seen our handyman’s face when I described what I wanted him to build. He couldn’t stop laughing! I guess that as the cats have their special porch, we might need to treat the dogs to a holiday gift too. 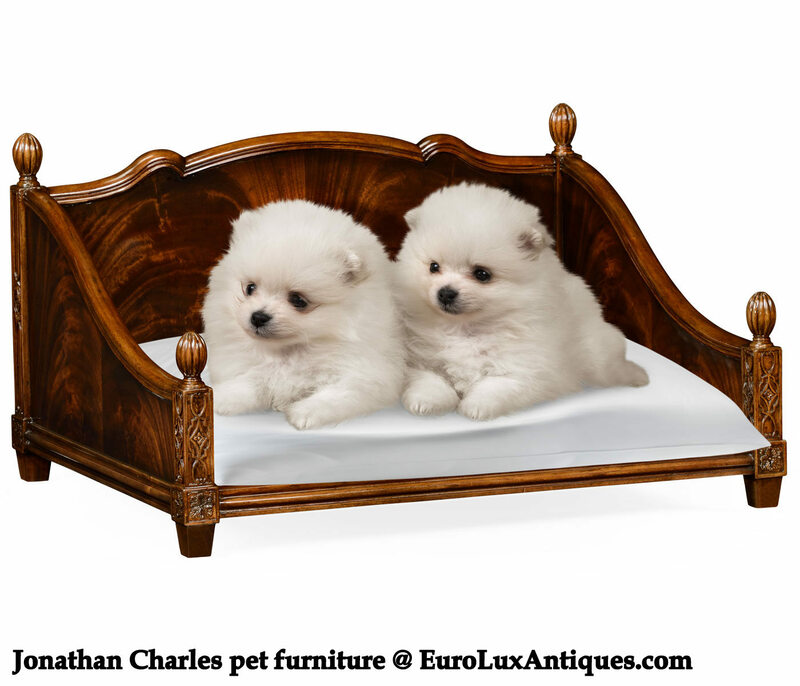 We stock a wonderful range of antique-inspired Jonathan Charles pet beds that make great gifts for pampered pooches. In different sizes to fit toy dogs to big boys, these pet beds are beautifully crafted. 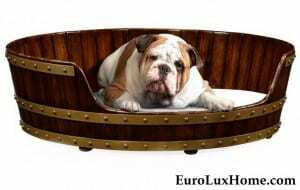 This walnut wood Jonathan Charles dog bed for larger dogs reproduces an original 1760 Irish peat bucket. The Jonathan Charles Country Farmhouse dog bed features distressed planked sides and patinated brass studded bands. Smaller dogs will look très chic lounging in the mahogany veneered Jonathan Charles four poster dog bed from the Buckingham collection. The fancy dog bed is easy for petite fluffy friends to hop in and out of, and it boasts fine carving to the uprights and turned finials. You can see all our other dog themed gifts (for pets and their people) at the link. I hope you enjoyed my pet gift post – tell us in the comments about your own pets! We can woof and meow about our fuzzy family all day. As a portion of all our sales benefit the PETS Inc. no-kill animal shelter, we’re grateful to any customers who buy their pet-lover gifts from us so we can help more homeless pets. 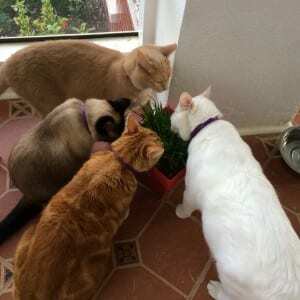 This entry was posted in Holiday Fun, News and tagged cat furniture, Cats & Dogs, dog beds, luxury pet furniture, pet furniture, pets, Pets Inc, upscale pet furniture on December 10, 2014 by admin. 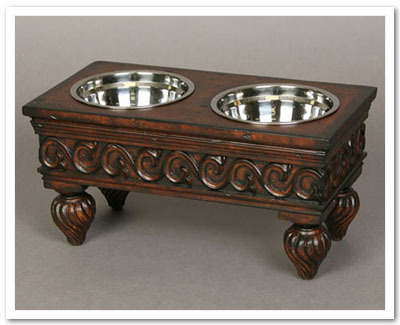 Although we usually focus on antiques and home decor for humans on this blog, today I’ve been looking at some amazing antique style pet furniture for your cats and dogs. As many of our customers and readers of this blog know, Greg and I have eight fuzzy children in the gallery and at home. 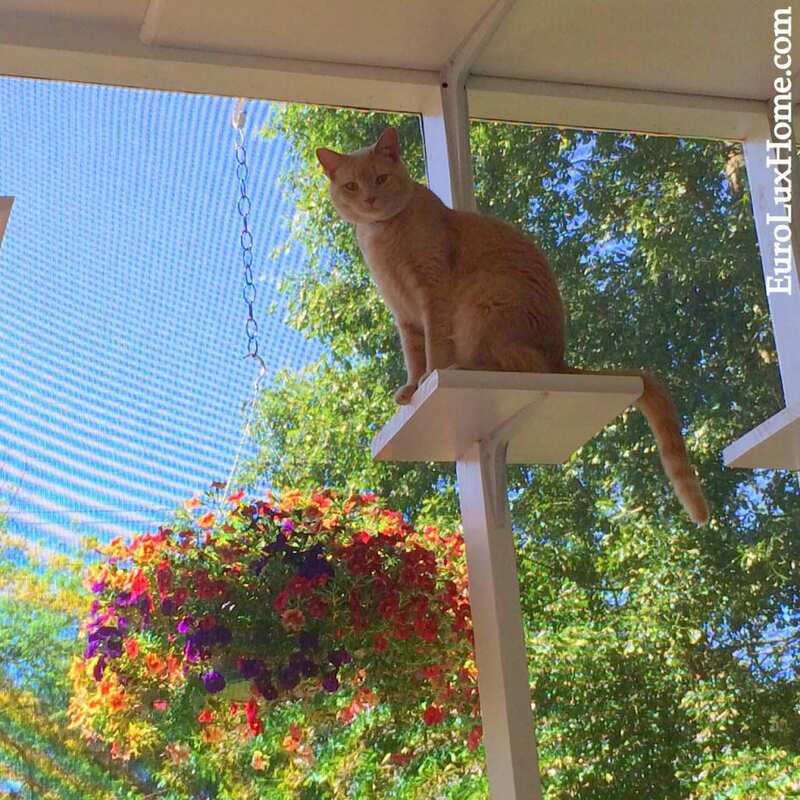 Our fuzzies aren’t too fussy – all our cats and dogs kick back and relax anywhere. Little Fozzy Talbot is even quite happy to make a bed out of his two buddies, Lenny & Squiggy, as you can see! But they’d probably also love some of the antique style pet furniture I found in my browse around the upscale pet furniture stores. At a quick glance, you might think this Renaissance style sofa is big enough for a person. Then you see the pretty pooch and realize it’s pet furniture from The Posh Puppy Boutique for a puppy (or puss) with very discerning tastes! Our customers who buy Renaissance style furniture from us (on a human scale) will surely love this! 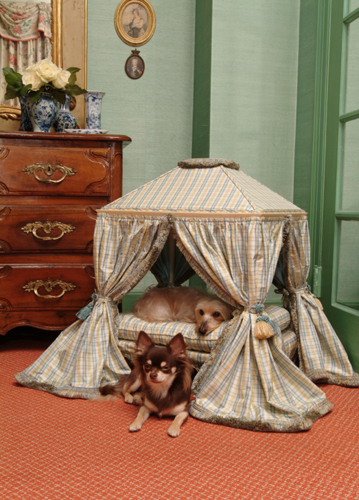 This rather grand Louis XVI style four-poster bed is for the pet who truly knows who is king around the house. The Precious Palace bed from Beyond the Crate comes in a choice of different fabrics, so you can match the colors and patterns of your home decor. We too will start offering some Jonathan Charles pet beds this year. Jonathan Charles has only just started making this new product line, so they won’t be ready for shipping until the fall. But you can contact us now to place early orders and I’ll tell you all the options available. 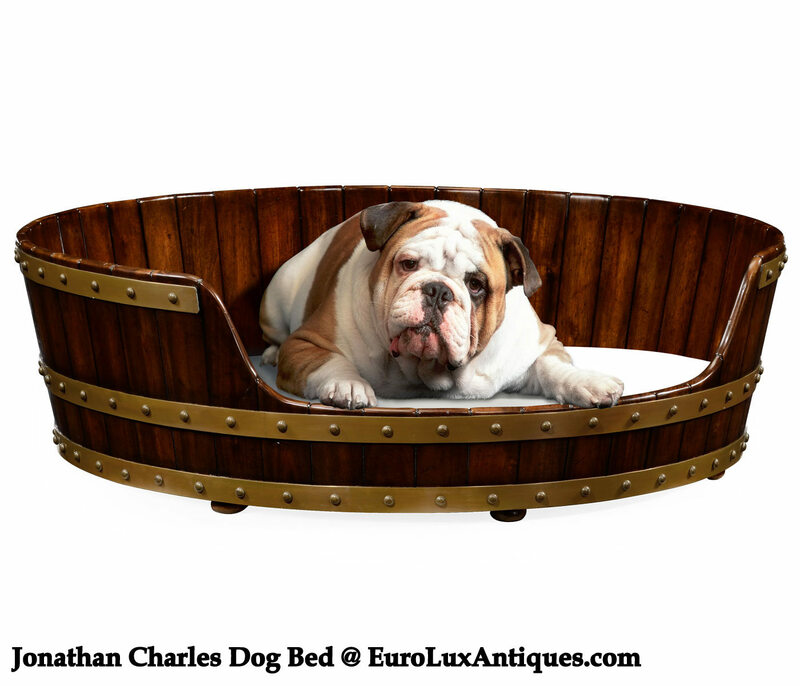 For larger dog s, this Jonathan Charles dog bed is crafted in walnut in the form of an Irish oval peat bucket. It’s based on an original from 1760, with planked sides, a distressed finish, and patinated brass studded bands. 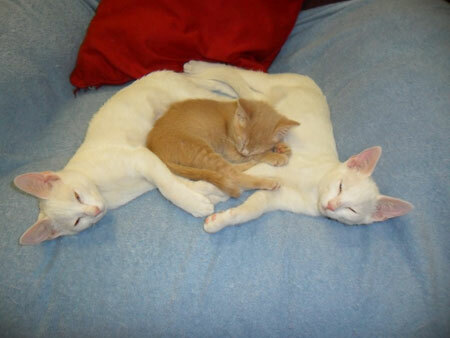 The dog bed comes in three sizes – 25″, 32″, or 40″ in diameter. 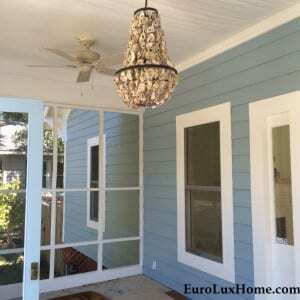 The largest size is $1495 at our discounted price, including free shipping. Dog not included! But isn’t he adorable? Many of our customers buy high-quality and beautifully crafted Jonathan Charles furniture from us – now they can treat man’s best friend too! Then there’s the mahogany veneered Jonathan Charles four poster dog bed from the Buckingham collection for the very pampered pooch! This will be 28″ high and 22″ wide. For fine dining, TeaCups Puppies and Boutique sells this charming raised pet feeder. 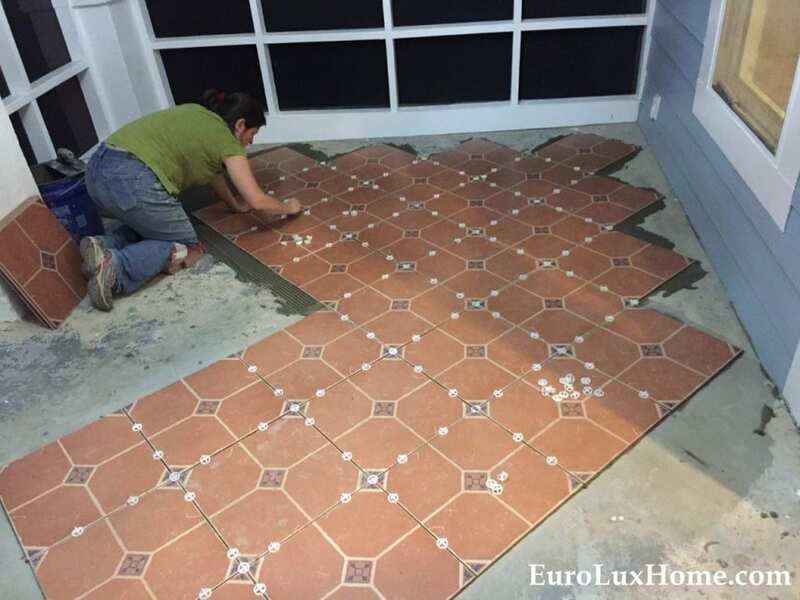 The scrolled pattern and elegant legs create an old-fashioned look that will team nicely with the traditional or antique furniture in your home. I’m not sure we’d have enough space for all our darlings though, when it’s feeding time at the zoo! 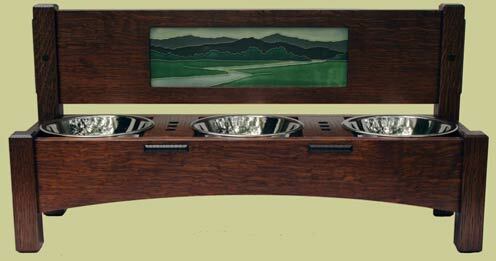 Or, if you love classic Arts & Crafts style decor, perhaps your pet (or several pets) will be delighted to lap up their dinner and water at this fancy Arts and Crafts dining station crafted by the brilliantly named Bungalow Bob’s Pet Designs. He also has some nice Mission style pet furniture, for our customers who want to match their pet’s accessories to their own Mission style home decor. Do you have a taste for Mid-Century Modern furniture? 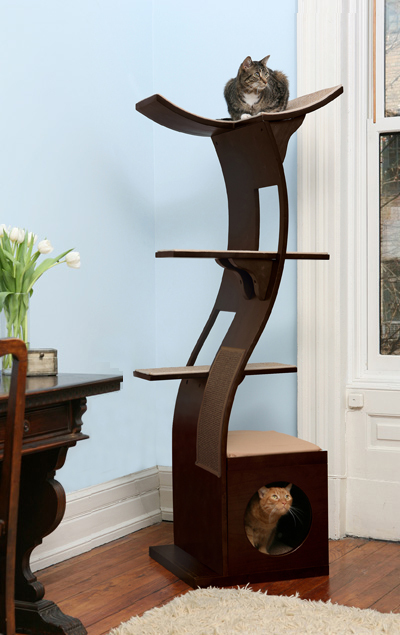 I reckon this cat tower from The Refined Feline would blend in beautifully with your interior design scheme. It turns a functional and fun piece of pet furniture into an attractive accent that will please the two-legged folk as much as the four-legged ones. It really is the cat’s meow! I hope you’ve enjoyed looking at some of these antique style pet furniture photos as much as I did. 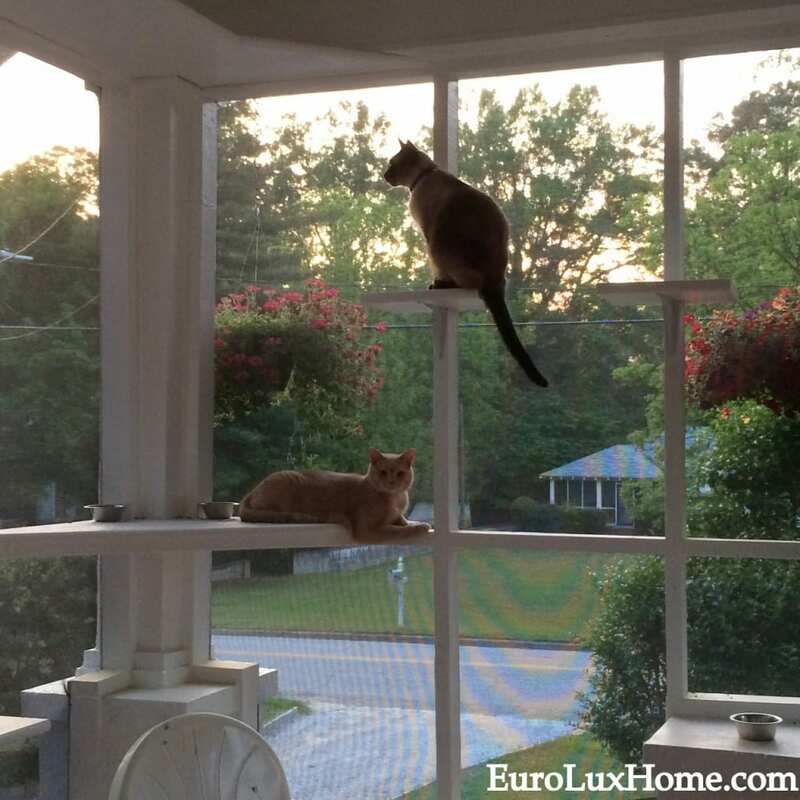 But now I’ve written this post, I realize that I can’t possibly show it to Lenny, Squiggy, Ozzie, Jake, and all the rest of the EuroLux Antiques brood of pets or they’ll be hounding me to give them a home makeover. Do you have any vintage or antique style pet furniture in your house? Tell us about it in the comments box below. 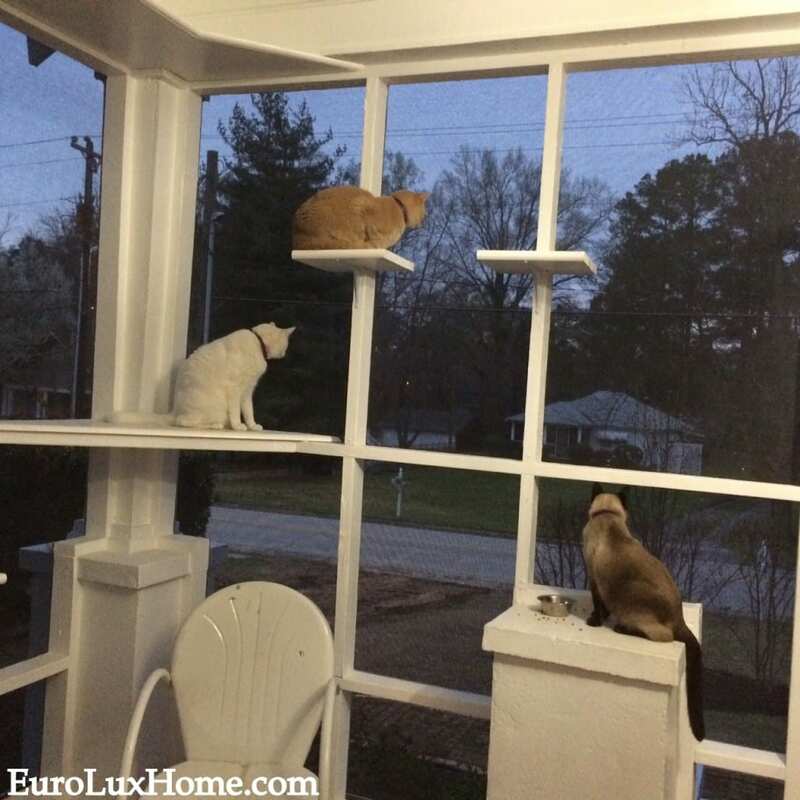 This entry was posted in Home Design Ideas and tagged cat furniture, dog beds, luxury pet furniture, pet furniture, upscale pet furniture on January 27, 2014 by admin.